The new addition is taking shape and, despite even more rain, the project is on schedule! The exterior walls and fascia match and recede into the non-historic 1950s kitchen addition, allowing the historic Clubhouse to retain center stage. Don’t miss Erin Pottmeyer’s latest photos documenting the construction in the Building and Grounds section of the newsletter. Speaking of center stage, the Fine Arts Awards Classical and Jazz Music Competition is Sunday, March 24, 3:00 p.m. at the SLO Nazarene Church. The talent and abilities of the students participating are inspirational and the event is thoroughly enjoyable and enriching. The Visual Arts Award- winner’s work will be exhibited, refreshments will be served and there is no charge to attend!! On Monday, March 25 at 5:30 p.m. the City of San Luis Obispo Cultural Heritage Committee will review The Monday Clubhouse Conservancy’s request for a Mills Act Contract. The Mills Act is a state law allowing cities to enter into contracts with the owners of historic structures. Such contracts require a reduction of property taxes in exchange for the continued preservation of the property. Property taxes are recalculated using a formula in the Mills Act and Revenue and Taxation Code. Please come to the meeting to show your support for this effort (City Hall, 990 Palm Street, SLO). Finally, the April 8 General Meeting will be busy with Board elections, Capital Campaign updates and a program featuring the FAA music and art winners! I look forward to seeing you there! On January 21, 2019, our long anticipated construction project started! The contractor is going great guns and we are excited by how much work has already been accomplished. As you know, the Capital Campaign (CC) is funding the construction project, so raising funds for the CC has become an all-consuming and urgent effort for the Board of Directors and CC committee. Our most immediate need is to raise $200,000, so we are thrilled to announce that The Monday Clubhouse Conservancy is the recipient of a Harold J. Miossi Charitable Trust grant in the amount of $100,000! A huge help to be sure, but this leaves $100,000 still to be raised and we need the help of our membership. In the coming days we will be reaching out to ask each and every member to make a contribution to this huge effort to preserve and restore our very special Clubhouse and grounds. The Board of Directors and the Capital Campaign committee look forward to discussing this in further detail at next Monday’s General Meeting. I hope you are all enjoying the last lovely days of 2018. In January 2019, as we begin a new year, we also begin our exciting construction project at The Monday Club. Undertaking this important renovation project will preserve our historic building and, importantly, make the premises legally compliant with the Americans with Disabilities Act by adding accessible restrooms and an accessible entrance. 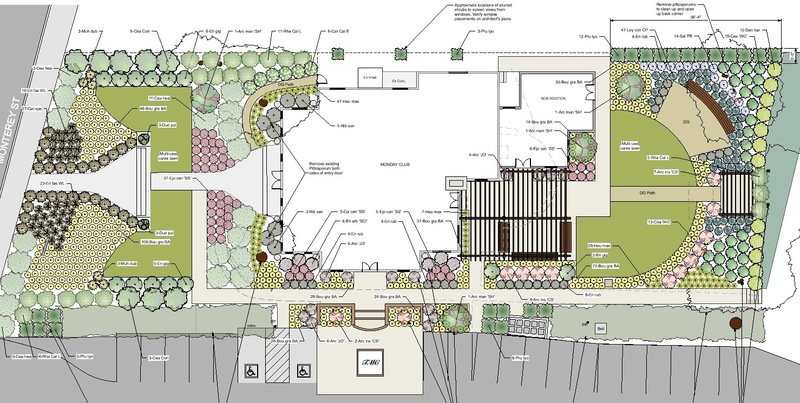 Additionally, a new water-wise landscape will rejuvenate the gardens, making them more enjoyable to our members and more desirable as an income-generating rental venue. The costs involved for this project greatly exceed our ability to fundraise as we normally would through our wonderful club events. Therefore, we ask that you please consider making a donation to The Monday Clubhouse Conservancy as one of your first good deeds of 2019. Our beloved clubhouse needs our help and any amount is greatly appreciated. All donors will receive recognition on our website and in our monthly newsletters. Major Donors and Angels will be recognized with an inscribed placard on our donor wall. The future of our historic San Luis Obispo gem is in your hands and heart! 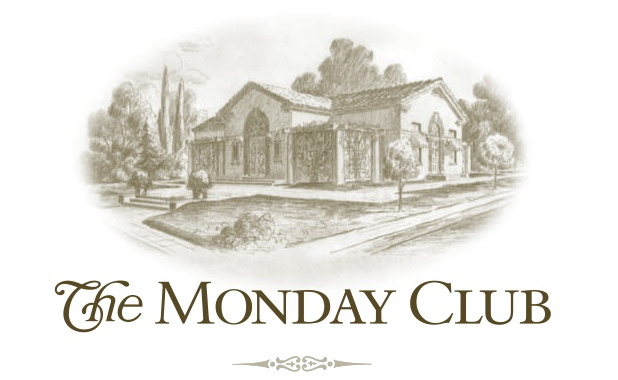 There are exciting goings on at The Monday Club this Fall! The month of October will end with Sip, Sample and Sari on Saturday, October 27. Everyone involved in the meticulous planning of this Indian-themed fundraiser is on pins and needles with anticipation for the day to come and the fun to start! There are still a few tickets left, if you are interested in being part of this not-to-be-missed event please click here. By mid-November, we will receive the contractor bids for our upcoming construction project. This is serious business but also moves The Monday Clubhouse Conservancy towards our goal of a early new year 2019 construction start date. We will be sharing easy ways that the membership can help with the effort at our December general meeting. I'm very much looking forward to our October events. We start the month with a program about Pacific Wildlife Care, a nonprofit organization based in Morro Bay. Founded in 1986, their mission is to care for sick or injured wild animals and return them, healthy, back to the wild. Presented by Jeri Roberts and Monday Club member, Becky Price, I am sure you will appreciate their work and dedication. Becky has loved and cared for animals since she was a little girl, so be sure to ask her about the number and type of critters that comprise her own menagerie! The month will conclude on October 27 with Sip, Sample and Sari. This indian-themed event is not to be missed! Bombay-sapphire martinis, henna painting and Indian dancers are just the start! Come and bid on a private art party led by our wonderful and talented member Tracy Taylor! Hope to see you there. First Meeting of the Club Year!! When I was elected President of The Monday Club over a year ago, I wasn’t quite sure what to expect. Up until that day, I had never been president of anything other than my own household. I have learned so much in the past months, and I want to tell you that it is truly gratifying and satisfying to work with such a smart, talented and energetic board of directors, committee chairs, and an amazingly generous, kind and supportive membership. We have accomplished many goals together, both large and small, and all of them important. We have our September 10 luncheon coming up and I look forward to seeing all of you. You will find that the luncheon reservation process has been beautifully updated, streamlined and made user-friendly by the group of smart, efficient and computer savvy ladies that worked together to get the job done. You will find easy to understand luncheon reservation instructions in the 'September Luncheon Menu Information' section of the newsletter. Many thanks to everyone who worked on this project. I hope each of you enjoys the last bits of summer. See you in a short couple of weeks. The longer days, blue skies, warmer temperatures and late afternoon breezes sure do make summer in San Luis Obispo County enjoyable! There are so many things to do outdoors, whether pursuing your fitness goals or opting for a more relaxing approach. We have accelerated installation of some of the new landscape that was scheduled for next year! I'm pleased to let you know that a thick, luxurious and soon to be very tall hedge of Podocarpus gracilior has been planted to screen our back garden from the new Monterey Hotel. If you are in the Clubhouse neighborhood, please stop by to enjoy it. Another welcome change is the format and appearance of this newsletter. We recently implemented a long overdue update of our website software that, in turn, necessitated some further tweaking, including an overhaul of the newsletter. Additional fine-tuning will be on-going and we can look forward to a fresh and updated web presence. We are so very fortunate to have member Cari Beetham as our Newsletter Editor. I look forward to seeing all of you at the May 7 General Meeting, where detailed information will be shared on the proposed building restoration, barrier removal and water-wise landscape project. The Landscape Plan below sets forth the scope of work. In the April member newsletter, a larger view of the new addition may be found.